Do you feel like your vampire look is missing something? Try adding a few spritzes of Vampire Blood Spray and see if this sticky crimson mist does not add the bloody look your vampire costume needs to really shine. And of course, this blood is not just limited to vampires. It can be enjoyed by anyone who thinks that their costume needs that extra touch of blood to make it that much more morbid and that much more impressive to see. Each package contains a small spray bottle which holds 2 fluid ounces of fake blood, which can be sprayed onto skin and clothing with remarkable ease. Please be aware that fake blood can stain some materials, so apply with caution. The blood looks and dries just like real blood does, and as an added convenience, the spray bottle is light so it can be carried with you, ensuring that you can discretely add touch-ups of wet, dripping blood whenever you feel the need! Fake blood is a great little touch that can accent dozens of different costumes, ranging from bestial vampires and zombies to modern day horrors like serial killers and sociopaths. 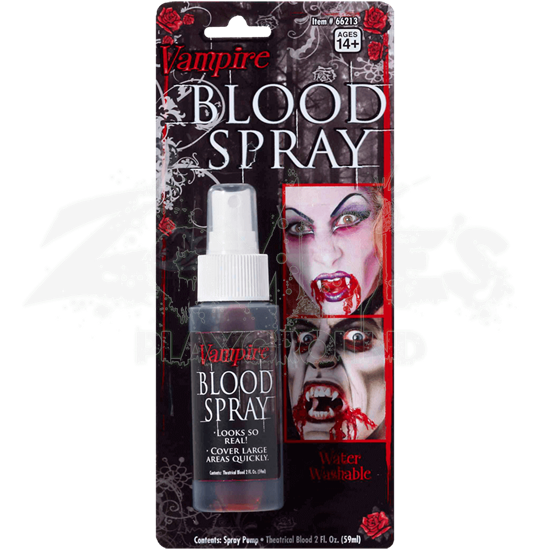 And if you are looking to be any of those for Halloween, do not be caught without your own useful bottle of Vampire Blood Spray!